Sterling falls back to the lower end of the 1.2600 range after a sightly hawkish statement from the US Federal Reserve. The British currency was pushed lower by the strengthening US Dollar as the Fed raised rates from 2.25% to 2.50% and signaled two rate hikes for 2019. Note that the pair did not fall much given that the main and most significant driver of the pair is Brexit. For today, traders need to focus on the movement of the US Dollar as the market continues to digest news from yesterday's FOMC meeting. Additionally, traders need to keep a constant look out for any updates related to Brexit. Furthermore, traders need to monitor the post interest rate decision press conference from BoE's Governor, Mark Carney. The Pound breaks below both the 13 and 50-period moving average signaling strong bearish momentum for the pair. Adding to the bearish momentum, the pair attempted to break above the 1.2685 resistance but failed multiple times. 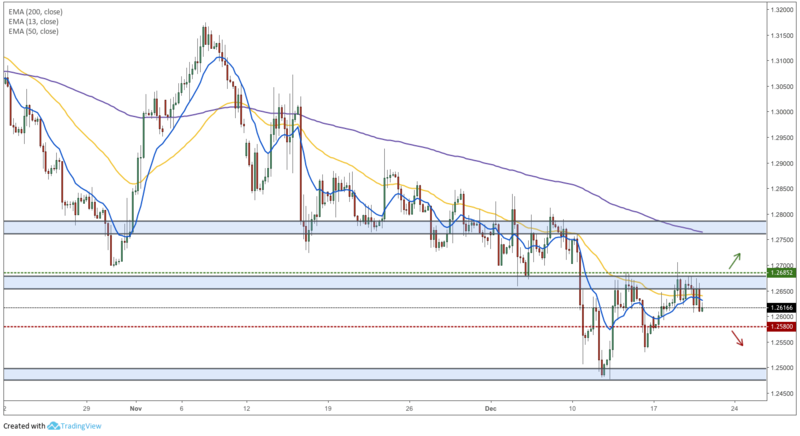 Moving forward, the pair will most likely continue lower but that will only be confirmed if prices manage to break below the minor 1.2580 support. On the other hand, if prices manage to finally break above the 1.2685 resistance, then a rise towards the 200-period moving average at 1.2745 is expected.